With the beginning of another autumn, University students begin another year. Each student’s academic path will be unique, but there are still many ways in which they all connect. One of those is your annual support. For example, last year the George Eastman Circle enabled the School of Nursing to increase the amount of financial aid it could offer students. That means more students were able to receive a top-notch nursing education. Our annual gifts also supported pilot studies conducted by the School’s faculty, which often lead to exciting opportunities for students to participate in innovative research. Before The Meliora Challenge ends in June 2016, the School of Nursing aims to raise another $5 million for students, faculty, and programs. 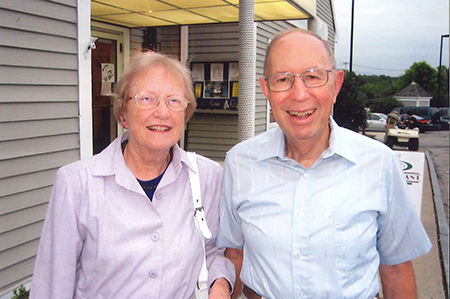 Jack and Anne Schottmiller, who are featured in this issue, are members who are helping the School reach its goal. I encourage you to read their story and consider designating a portion of your annual gifts to the School of Nursing, or any other school, program, or initiative that is important to you, when your membership is up for renewal. Year after year, our gifts have a remarkable collective impact on the student experience, faculty research, patient care, and the creative endeavors that shape our culture. The George Eastman Circle’s leadership through annual giving is vital to the University’s future. Through your membership, you honor George Eastman’s legacy and contribute to the effort that is further realizing Eastman’s vision for Rochester and its place in the world. Thank you for your commitment to making the University and the world ever better. In two weeks, the University community will celebrate its 15th annual reunion, family, and homecoming weekend. We are also looking forward to celebrating your membership in the George Eastman Circle. As a special thank you for your leadership, dedication, and generosity, during Meliora Weekend, you will have exclusive access to a hospitality suite and a special reception before Emmy and Tony Award-winner Kristin Chenoweth’s performance. In addition to these exclusive options, be sure to register to see the weekend’s other featured guests—best-selling author Walter Isaacson and The Daily Show with Trevor Noah correspondent Aasif Mandvi—and exploreCollege Town, an exciting, new neighborhood of restaurants, retailers, and other businesses that is only minutes away. See below for details. Dinner reception tickets, which also provide access to the Gallery, including the Jacob Lawrence exhibit The Legend of John Brown, are $25 per member. For more information, please contact the Office of Donor Relations at 800-281-2055 or DonorRelations@rochester.edu. *The Chenoweth performance is sold out and tickets are no longer available through the Eastman Theatre Box Office. A limited number of tickets are available through the Office of Donor Relations; call 800-281-2055. Visitors can enjoy food, drink, the company of other members, and entertainment from student musicians. Family and friends are welcome to join. To purchase tickets, please visit rochester.edu/melioraweekend. Located at the intersection of Mount Hope and Elmwood Avenues, College Town provides several places for you to dine, shop, and treat yourself to some relaxing and fun activities, including Corner Bakery, Barnes and Noble, and Breathe Yoga. Parking is free, but there will also be shuttle service from the River Campus throughout Meliora Weekend. For shuttle times, see the map in the Meliora Weekend Pocket Guide you receive at registration. 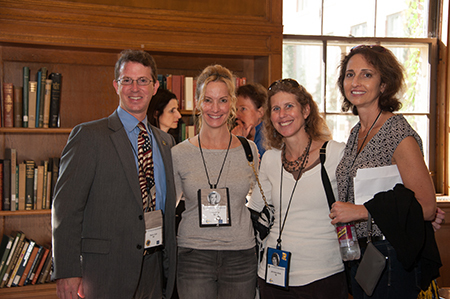 For more information about the Meliora Weekend registration process follow your member level: Associate and Member; Fellow, Benefactor, Patron, and Founder. All of our George Eastman Circle members have wonderful stories to share. We are pleased to feature this story from a couple who supports the School of Nursing. The year was 1949 when John (Jack) Schottmiller ’53 entered the University of Rochester as a freshman. He chose this University because of its reputation, confident that a Rochester degree would either get him into graduate school or a good job. At a time when there were still separate campuses for men and women, Jack and his friends were especially fond of the monthly dances hosted by the School of Nursing. He eventually married a nurse named Anne, who was among the first class at Georgetown University to earn both a bachelor’s degree in nursing science and an R.N. Her career choice made an impression on their daughter, Julia Schottmiller-Koestner ’84N, who earned her nursing degree at the University of Rochester. Interested in gerontology, she pursued her master’s degree in nursing science at McGill University’s Ingram School of Nursing in Montreal when she and her husband, Richard, moved to Canada. Tragically, Julia was killed during a visit to Prague in 1990 and was awarded her master’s degree posthumously. To preserve her memory and encourage other young nurses like their daughter, Jack and Anne established an endowed scholarship in her name. As the couple added to the fund each year, they developed a habit of generously giving to the School of Nursing. The couple remained active supporters of the School, regularly attending events and enjoying opportunities to meet each dean over the years. When asked to join the George Eastman Circle, they knew they would direct their support to the School of Nursing, but now their generosity would be applied to more than scholarships—it would go to wherever the School needed it most. George Eastman Circle members have pledged more than $65 million in annual funds since the program’s inception in 2007. 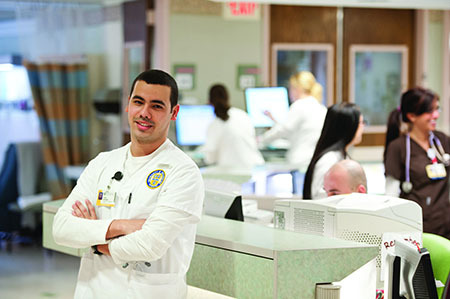 Students, faculty and staff, and patients feel the impact of these gifts every day. Below are some of the areas where your support has helped enable significant advancements and achievements. Learn more about your philanthropy “at work” by following the links below. Students and research were among the top beneficiaries of your unrestricted gifts. Innovative research is an important part of the School’s core mission, as is developing the next generation of nursing leaders. You contributed to success in both of these areas by providing funds for pilot studies and financial aid. Your annual gifts have made a significant difference in the lives of Simon students. More than 70 percent of top Simon candidates were able to enroll in the full-time MBA program because of increased scholarship support. Designating your gift to VNS supports the Nurse-Family Partnership (NFP), a vital service which gives vulnerable first-time mothers a chance to create a better future for their families. Since 2006, the NFP program has helped more than 1,100 families throughout Monroe County. This is just one example of the impact your gifts have made on VNS and the people it serves. Are you part of our social circle? The George Eastman Circle LinkedIn group provides an opportunity to network with members from around the world. This online network also offers members a way to keep current with the achievements and accolades of current members and is a valuable source of feedback and insights on areas of interest to you. To join our exclusive members-only group, you need to have a LinkedIn account. Once you have created an account, or if you already have one, visit the George Eastman Circle LinkedIn page, and click “Join” in the upper-right-hand corner of the screen. As George Eastman Circle members, your commitment to philanthropy makes you leaders within the University. 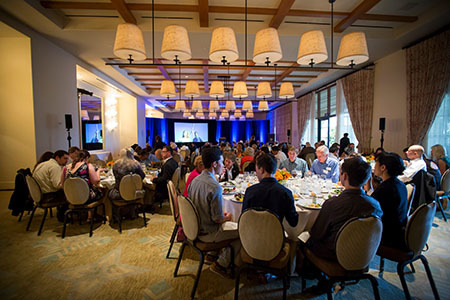 Your annual support provides critical funds that enable world-class research and health care, create countless academic opportunities, and cultivate the imagination. The Charter Members featured below have made significant Campaign gifts in addition to their membership commitments or have exemplified Meliora in the areas of academia, health care, arts and culture, and/or research. With a $2 million commitment, Trustee Ani Gabrellian ’84and Mark Gabrellian ’79 created the Ani and Mark Gabrellian Humanities Center Directorship. The Gabrellians made an additional commitment to also establish the Hagop and Artemis Nazerian Humanities Lectures, named in honor of Ani’s parents and their belief in the benefits of a humanistic education. The annual lecture series will be held at the University and feature thought-provoking presentations from faculty members—at least once every four years it will take place in New York City. You can read more about the Gabrellians and the new directorship and lecture series in the official press release. Emmy-winning composer Jeff Beal ’85E and vocalist Joan Beal ’84E, made a $2 million commitment to launch the Beal Institute for Film Music and Contemporary Media at the Eastman School of Music. The Beal Institute will provide students with instruction and experiences that prepare them for the increasing and evolving opportunities to write, produce, and perform music for film and contemporary media. You can read more about the Beals and the new institute in the official press release. 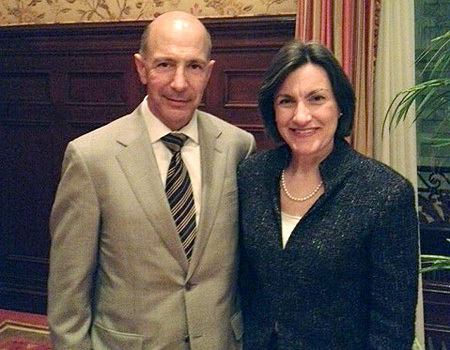 Recently, Peter A. Knight ’87 (Flw), P’11, P’19 was recognized as an outstanding surgeon, researcher, and mentor during a ceremony installing him as the inaugural Marjorie B. Morris Endowed Professor in Cardiac Surgery. In addition to providing excellent patient care, Knight supervises cardiothoracic fellows and residents and mentors pre-med students interested in cardiothoracic surgical research. His own clinical research aims to expand innovative surgical device development. You can read more about Knight receiving this great honor in the press release for the professorship’s establishment and in the August issue of Fast Forward. One of the ways we’re able to thank you is to extend invitations to various regional gatherings, dinners, and University programs. For more information or to register for any of the following events, visit the Alumni Events page or contact the Office of Donor Relations at 800-281-2055. Featuring Raffaella Borasi, dean of the Warner School of Education and Frederica Warner Professor and Wesline Manuelpillai ’16, a political science major. George Eastman Circle members are invited to a special pre-event reception beginning at 5:30 p.m.
6:30 p.m. at the W Washington, D.C.
Gloria Culver ’94 (PhD), dean of the School of Arts & Sciences, will discuss current University initiatives and her priorities as a first-year dean. Scholarship recipient and economics major Ervis Vukaj ’16 will speak on his student experience. Gloria Culver ’94 (PhD), dean of the School of Arts & Sciences, will discuss current University initiatives and her priorities as a first-year dean. Scholarship recipient and Chicago native Scott Lamm ’16 will speak on his student experience. 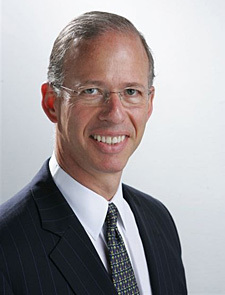 Attendees will hear remarks from President and CEO Joel Seligman as well as a performance from students from the Eastman School of Music. Registration will be available in October.